Barangay Mauswagon is one of the nineteen barangays in the Municipality of Calamba. The people of barangay Mauswagon are depending on their ways of living in cultivating the land to raise some crops used for food such corn, cassava, gabi and some root crops and vegetables. Mauswagon before was inhabited by the native people known as Subanin tribes. Whose family names were Totong, Anyag and other native families. Barangay Mauswagon, was created since 1930 under the leadership of Juan Pangilinan bearing the position as Barrio Encardo, The mother town of Calamba before belong to the town of Plaridel, which known as Soling. The chief executive was Bernado Neri duly appointed by Pres. Manuel L. Quizon. Barangay Mauswagon is an upland area located along the National highway on the Eastern side of Calamba. Its distance from the town proper is 7 kilometers away from the heart of the town proper and it takes fifteen (10) minutes to travel. Mauswagon is bounded on the North by Dapacan alto, South by Siloy, and East by Bonifacio & Salvador. The barangay Mauswagon was divided and distributed into seven puroks (7) wherein purok 5 is the largest household member’s population with 95 household. The barangay record shows that the brgy was created in the year 1930 but there is no exact of month. Barangay Mauswagon in one of the 19 barangays of the Municipality of Calamba It is located in the western part of Calamba. Mauswagon is accessible through motorcycles locally known as habal-habal. A passenger’s fare by haba-habal costs Php 10.00 for regular and Php 30 for special trip. 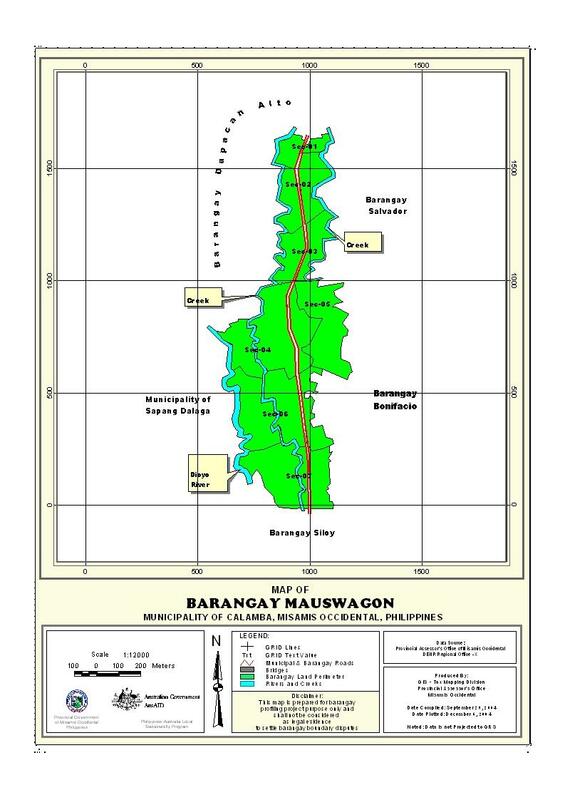 , Barangay Mauswagon has an area of 529.8099 hectares wherein 80% is agricultural land. The Barangay together with the Municipality is the same climatic classification, wherein there is no distinct wet and dry season. The rainiest month is December while the direst month is March. is evenly distributed throughout the year.